Each FME translation is usually a single process on your computer. However, FME can be set up to take advantage of multiple-core processors and improve parallelization of computations (doing multiple tasks at once). FME also makes use of hyper-threading, a technology used to make each physical core appear as two logical processors to the host operating system. By using parallel processing, performance may be improved significantly over a single process. As of FME2019, the Parallel Processing options have been removed from most transformers and exist only in the custom transformer infrastructure. A separate article exists to explain setting up parallel processing in a custom transformer. 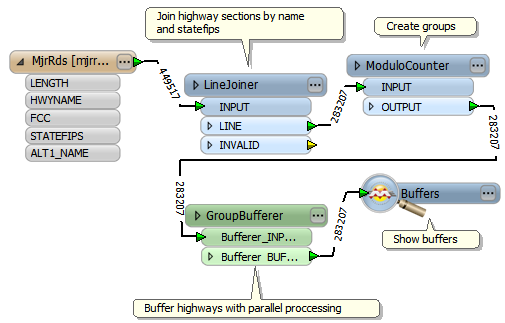 For a more basic introduction to parallel processing, including a step-by-step tutorial exercise, see the article How to Use Parallel Processing in FME . 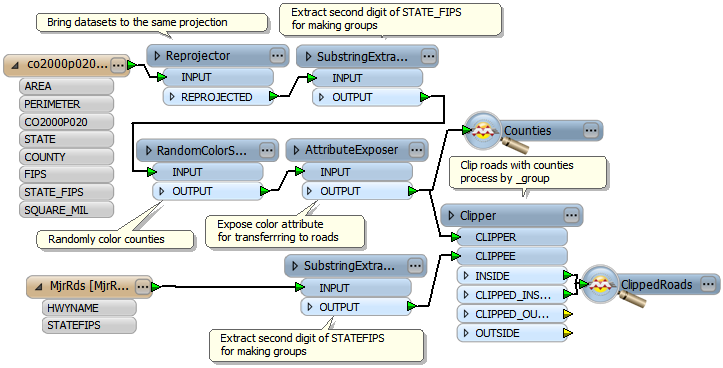 As a brief introduction, note that each parallel process in FME uses its own set of data, and data cannot be passed between processes. Therefore you must divide data into groups using a Group-By parameter, and set each group to be handled by a different process. Here a user is calculating statistics about the number of visitors to parks in the city of Vancouver, using FME's StatisticsCalculator transformer. Each park has an attribute that defines which neighborhood it resides in. That neighborhood attribute is used to group the data and by setting a Parallel Processing Level, each group is handled by a separate process, potentially improving performance. However, there is a limit to the number of processes that FME will create. This limit is tied to the FME license level. FME Base Edition allows a maximum of 4 processes; Professional Edition: 8; All other editions: 16. Data must be divisible into groups. If no group attribute is selected set in the transformer Group By, there will be no parallel processing. Groups will be processed independently. In the above example, each neighborhood will get its own set of statistics. If features in one group depend on features in another, then processing them separately will produce incorrect results. If you do not have an attribute that defines groups, then groups can be created using other transformers such as the ModuloCounter. This blog post explores different techniques for creating artificial groups. Parallel processing only makes sense when the data volumes are big enough - for smaller datasets, the overhead of running multiple FMEs can easily make the translation slower than a single process. i.e. if there are only a handful of parks in the above example, then the benefits of parallel processing can be negated by the cost of starting multiple processes. A greater number of parallel processes does not always correlate with better performance. For example, in "Aggressive" or "Extreme" mode, there might be so many processes that they are fighting each other (or the operating system) for system resources. Rather than have a single transformer carry out parallel processing, it's possible to enable parallel processing on a whole group of transformers. This is done by creating a Custom Transformer from that group. A custom transsformer has its own parameters for parallel processing, and it does not have to be limited to a single transformer within it. Using a Custom Transformer like this also means that the "group by" and "parallel process by" settings can be different (for example I might group my parks together by neighborhood, but parallel process them on the basis of city). This is a set of examples where Parallel Processing was of use. For a tutorial to carry out yourself, see this page. All examples here were conducted on a Quad Core (8 virtual processors) machine with 4Gb of RAM on a 64-bit Windows platform. 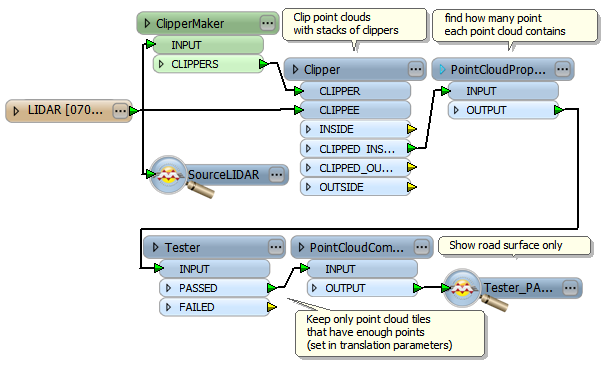 Keep in mind that results may vary depending on hardware configuration and FME version. Because surface modeling is such an intense process, using parallel processing can be very beneficial. The RasterDEMGenerator group-by is set to fme_basename to process each point cloud as its own group. Moderate is the best result here, over twice as fast as no parallelization. Minimal parallelism is slower because it does not use the full processing power. Aggressive and Extreme modes are slower because they are using full processing power at each others expense. In a second test, the point cloud files are grouped according to the first character of their name (this is what the SubstringExtractor transformer is for). TINGenerator is another subset of SurfaceModeller similar to the RasterDEMGenerator. A single TINGenerator in this example takes five minutes to produce a surface. However, even before parallelism, we can use a trick where one TINGenerator makes small surfaces (from each source LAS) with a second TINGenerator to combine these small surfaces into a single surface. Based on the results of the tests above we can decisively conclude that parallel processing allows faster surface modelling and can be recommended for the machines supporting multi-threading. This example uses a Shapefile dataset containing major US roads where the intention is to buffer each road with a 25 m buffer. The process will wrap the Bufferer transformer inside a custom transformer so that the Group-By parameter can use a different attribute to the Parallel Process By parameter. As we can see, the smaller sizes of the groups in the last test do not compensate the multiprocessing overhead (firing up FME sessions and sending features between FME instances). This would be less of an issue were each group to have a much larger number of features. Without parallel processing, one single process can hog resources, paralyzing the computer while FME optimizes memory use and caches data to disk. For more information, please see Parallel Processing documentation or the Parallel Processing section of the Desktop Advanced Training.